An IT support professional’s perspective on change. Ever wonder why change is so hard. Join us as Mary Therese Durr, Director of Computing Support and Service Management at Boston College shares her experience with change and the dragon that impedes acceptance. 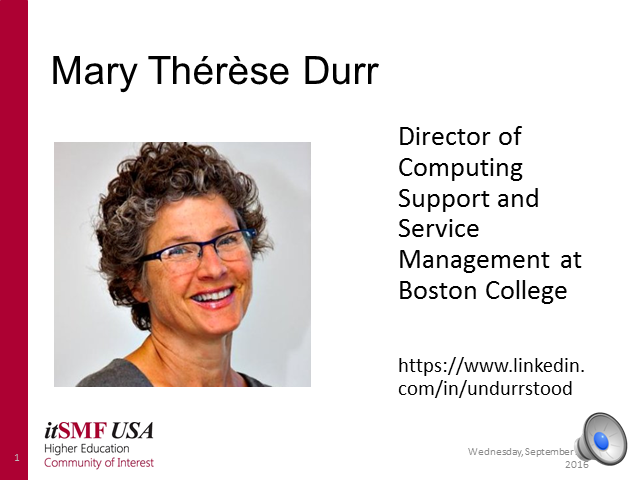 Mary Therese Durr is the Director of Computing Support and Information Technology Service Management at Boston College. Mary entered the technology field over twenty-five years ago as a computer programmer. She has moved from software development to computer lab management to networking to systems management and lastly to directing those who do all the real work. Her specialty is discovering people’s strengths. Mary has her Master's in Education, Research, Measurement, and Evaluation from the Boston College Lynch School of Education. The best way to engage all employees is through their managers. Therefore Mary includes in her responsibilities partnering with Information Technology Services (ITS)-Human Resources to build and support a management training program for ITS as well as consulting with management as needed.